Phillip Santana lost 25 lbs. in 90 days with Body Beast. He entered his results into the Beachbody Challenge, and won the $500 Daily Prize for October 18th! 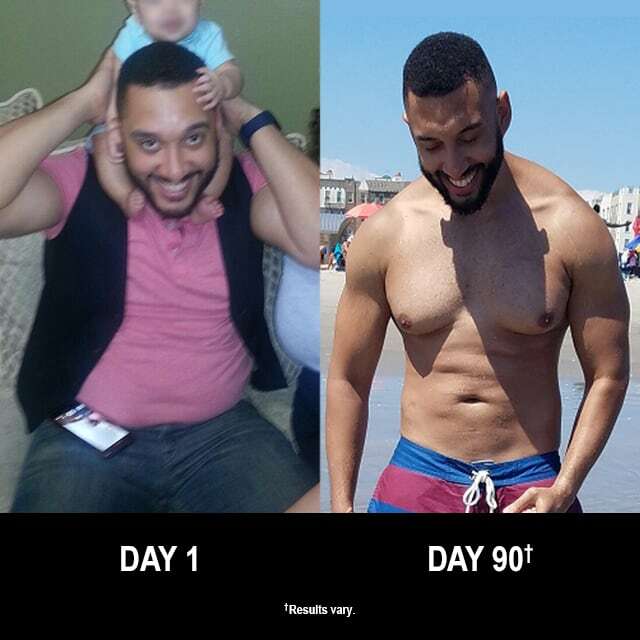 At 28 years old, I felt that I was too young to have a “Dad Bod.” It was then that I decided to make a change. I wanted to set a good example for my son by becoming healthier and also so that I can keep up with him as he grows up. I decided to give Body Beast a try. I had done P90X before in the past and got excellent results, but coming from a gym background, I wanted to build a little more muscle. Body Beast was the perfect fit! The greatest challenge I faced was consistency. It was difficult for me to balance work, family life, and trying to find time to exercise. The fact that the Body Beast workouts were less than an hour made it feasible for me. It also helped me become accountable for my workouts. I was inspired each and every day to keep up with the program. I was able to do the workouts at home with minimal equipment and got great results! Now I’m in better shape than I was when I was going to the gym and got it all in the comfort of my own home! I went from fat dad to fit dad! My takeaway from all this is that all busy dads can indeed get in great shape, and Beachbody can definitely help you get there! The fact that the Body Beast workouts were less than an hour made it feasible for me. As I mentioned before, I had done P90X in the past when I was in college. I had all the time in the world back then and got excellent results, but the workouts were a little too long for me to keep up with. Body Beast was perfect in balancing my workouts along with work and family life. I also loved the fact that I was able to do the workouts at home with minimal equipment! I didn’t even need to go to the gym! I got work done with a few sets of dumbbells, a swiss ball, and a doorway pull-up bar! The results that I achieved from Body Beast were amazing! I was able to build muscle and lose weight at the same time! I got leaner, my pant size went from a 36 to a 33, and my weight went from 215 lbs. to 190 lbs. I’m very proud of the fact that I was able to achieve this! I don’t know too many dads that are able to balance work, family life, and their own personal fitness. If I can do it, then all of the busy dads out there can do it too! My life has changed for the better! I look way better now than I did when I was working out at the gym! It’s amazing that you can get in great shape in the comfort of your own home. I’m stronger, have more energy, and can keep up with my son as he’s growing up! My wife isn’t complaining either! Thank you, Beachbody, for making all of this possible!